E-T-A Circuit Breakers, quality designer and manufacturer of a broad range of electro-mechanical and electronic products for circuit protection, offers the BMS01 Battery Master Switch designed for hazardous goods carrying road vehicles that comply with the European International Carriage of Dangerous Goods by Road (ADR) regulations. The environmental protection and intrinsically safe control circuitry of the BMS01 are in accordance with ADR 2011. The battery master switch also satisfies the additional requirements of UK operators. 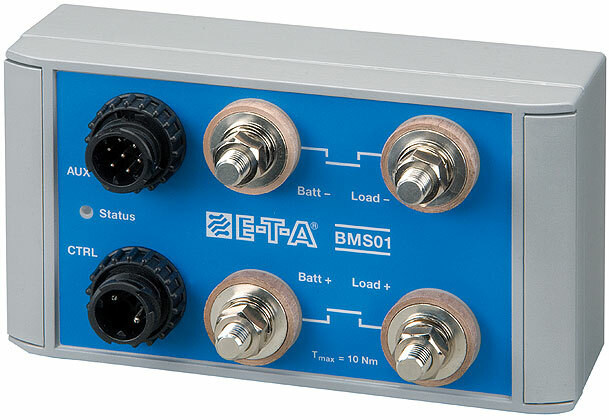 The BMS01 will serve as an emergency shut down switch as well as disconnecting and reconnecting the vehicle’s electrical system when loading and unloading. The double pole E-T-A BMS01 Battery Master Switch is installed close to the vehicle’s battery, between it and the electrical system: it can also be connected to act as a single pole device. The battery master switch can then be operated by means of a control switch in the cab, with optional additional control switches sited around the vehicle as required. Upon disconnection of a control switch, the main contacts of the BMS01 will open after a preset delay to allow for the controlled shutdown of computerised engine management systems. A choice of two delay times is offered, with auxiliary contacts providing output for an audible alarm during the delay period. Additional auxiliary contacts are provided for disconnection of the ignition circuit and de-energising of the alternator field winding. There is also a permanently energised protected output for the tachograph supply. A choice of low voltage monitoring is available if required: it offers automatic disconnection of the battery after one minute, or signalisation, if undervoltage is detected while the vehicle is idle. This offers protection of the battery from the effects of deep discharge and ensures there is sufficient battery capacity for re-starting the engine. 12v and 24V versions of the BMS01 are available. An integral ATEX-approved safety barrier permits siting of the unit in hazardous areas. The master switch features a housing protected to IP65 with rubber caps on the terminals offering protection to IP54. A bi-colour LED on the body of the master switch provides clear status signalisation of the battery isolation switch and low voltage detection. E-T-A can supply suitable control switches for the BMS01, protected against inadvertent operation. An externally mounted switch assembly is also available incorporating the green “ON” status indicators mandatory in the UK.